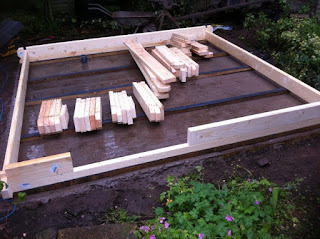 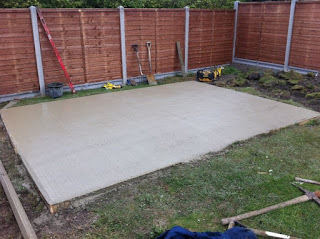 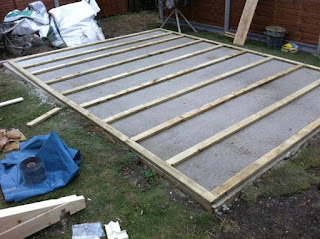 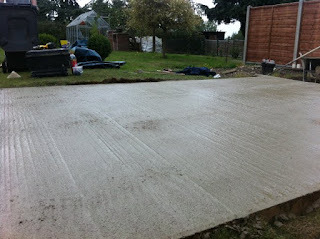 Installation of a Devon 3m x 3m having completed the concrete base the day before. Blink and you'll miss it! 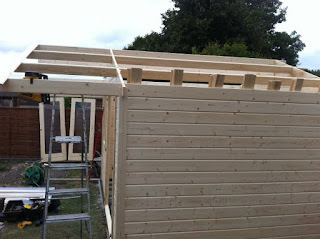 It was so damp during the assembly that there wasn't much time for pictures! 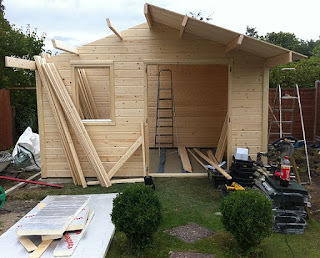 Not much space to sort the pieces. 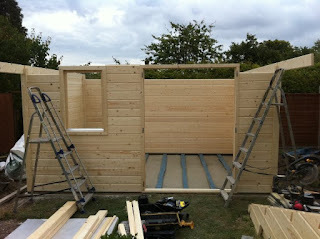 A tight squeeze with overhanging branches and established architectural planting in place! 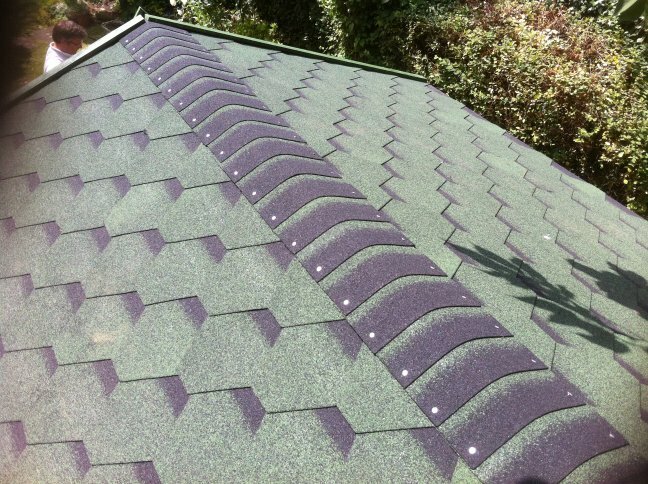 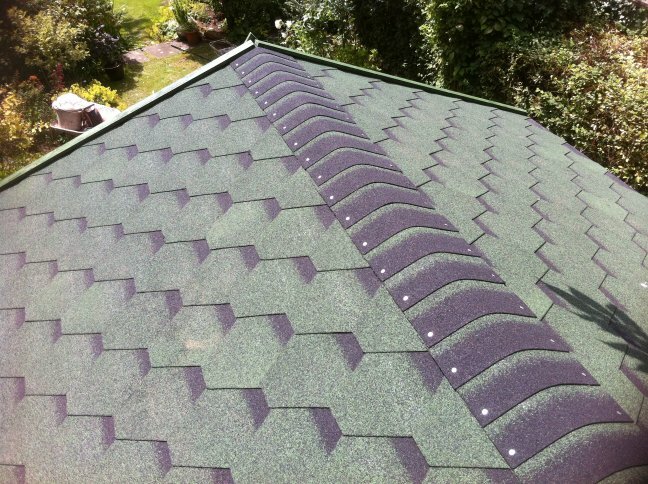 The green hexham bitumen roof tiles are complete. 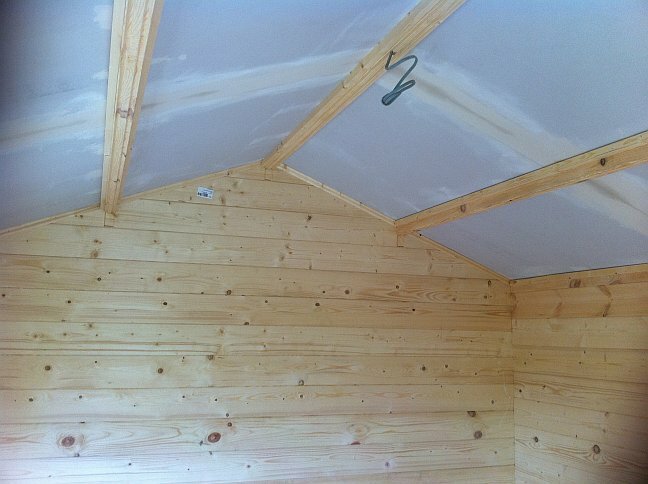 Insulated ceiling with 50mm Celotex, 9.5mm tapered edge plasterboards and timber edging to finish. 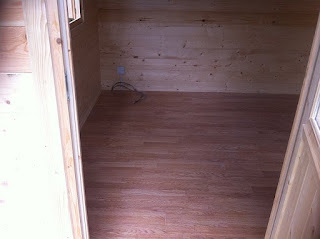 50mm Celotex or Kingspan in the floor followed by underfloor heating and then finished with oak effect laminate. 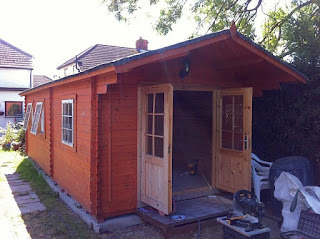 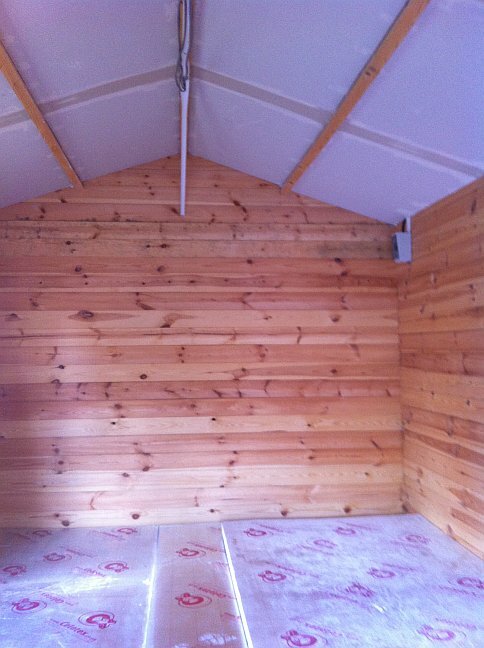 This week we were asked to insulate a log cabin purchased a few years ago from a competitor. 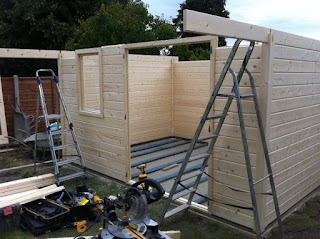 The company in question were asked if they would fit insulation but they said they couldn't we on the other hand were more than happy to help. 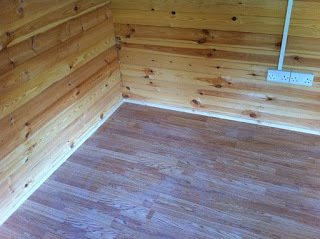 Celotex on the standard floor if sufficient drop over the door threshold. 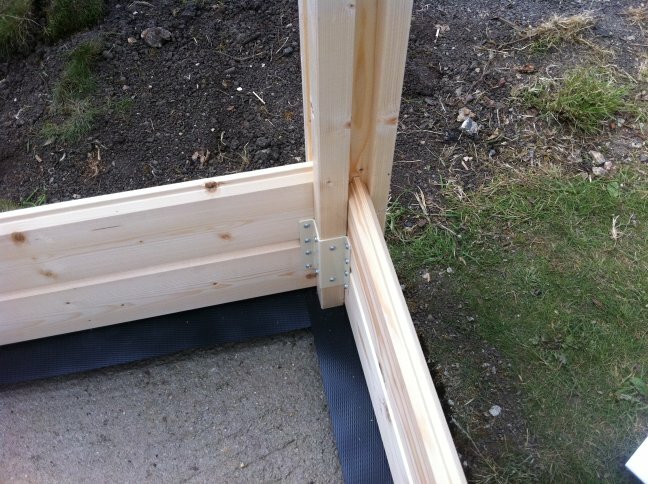 This could be a problem if the door has a low threshold and may mean lifting the standard floor to fit insulation underneath between the floor joists. Obviously this is easier if insulation is added during installation as lifting the fitted floor without damage could be difficult. In this case there was a 70mm drop across the threshold which is more than enough. 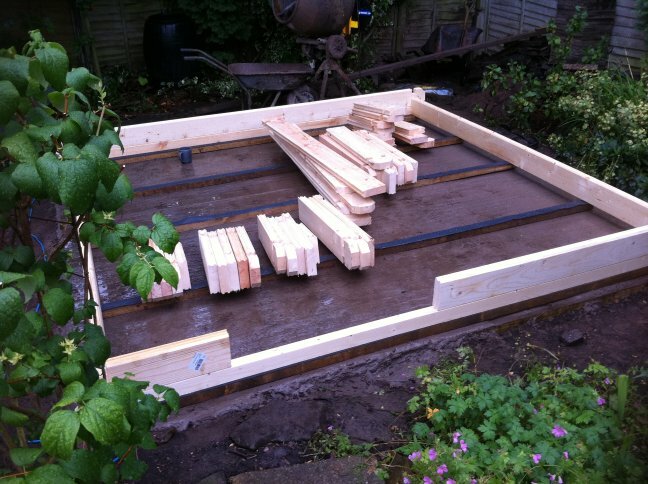 We fit 50mm Celotex in the roof and floor and most typically laminate or real wood floors on top of the insulation. 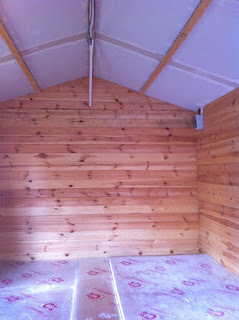 Ceilings are finished with 9.5mm tapered edge plasterboard between the rafters and then edges are tape and joint filled. Finally the edges of the plasterboard and laminate floor are finished with a finishing timber. This finishing timber also helps to support the plasteboard. 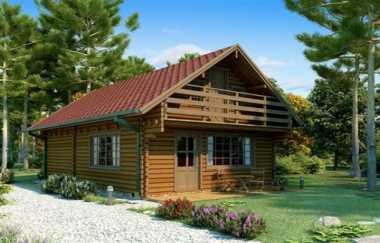 Do you need larger log cabin doors? 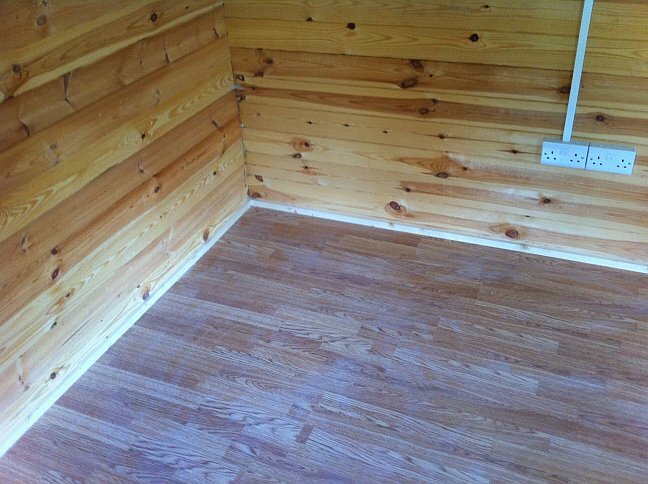 On a recent project, one of the the most surprising things we found, about a cabin supplied by another company, is just how low the doors were. The opening is only 5 feet 5 inches. 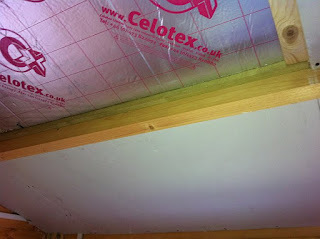 As a consequence whilst we were retro-fitting the insulation we found ourselves banging our heads on the door frames on more than one occasion. The first time this has ever happened in our experience. 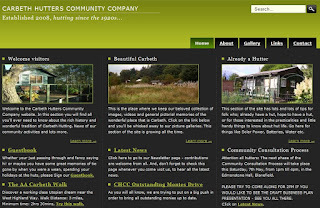 We found it rather amusing that this company (to avoid their prolific intellectual property applications we'll call "Hunster Douse" ) devotes a large percentage of its website to critcising competitors and yet in truth it is actually criticising the very same models they were supplying only a few years ago. 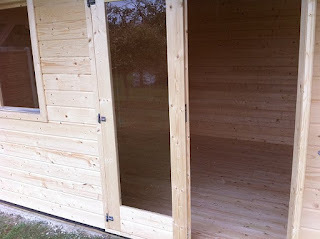 It did make us think that there must be many more customers out there with doors that are too small so if you find yourselves in this predicament please contact us for a quotation to change the doors to safer and more practical door sizes for your garden office. With the holiday season in full swing thoughts turn to getaway breaks, a chance to enjoy the countryside, experience a peaceful time and take things at a slower pace. 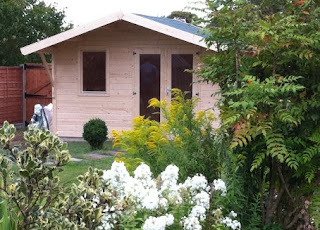 With the rising Euro many more of us are looking at holiday destinations here in the UK. 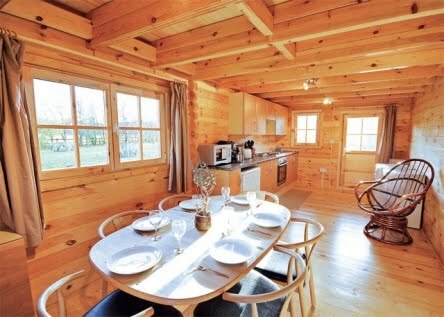 The rise in holiday park breaks is set to continue and what better building to fit in with natural surroundings is there than a log cabin? Any log home immediately looks good in a natural setting and the feeling of being one with nature continues when you walk through the door into the open plan living space. We can supply multiple orders of log cabin lodges allowing you to budget your project into separate phases if you desire. 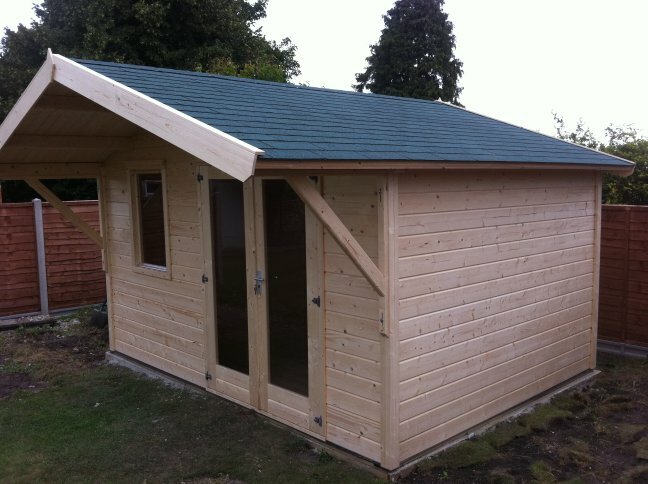 Perfect also for toilet block facilities or utility facilities for campsites our log cabin kits are very adaptable. 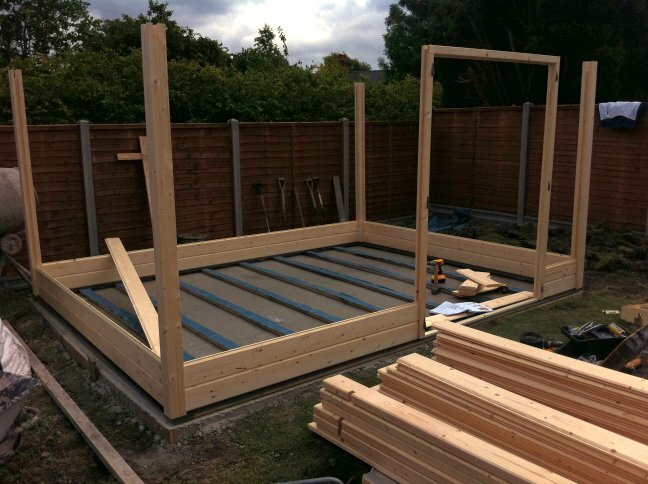 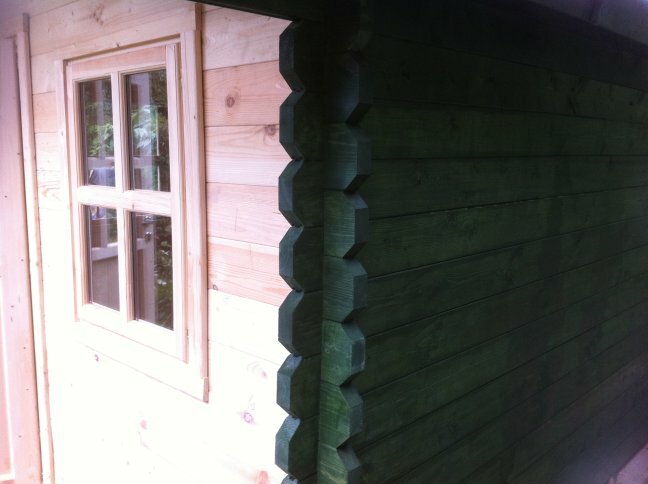 Our ability to offer a bespoke log cabin design service means virtually anything is possible. 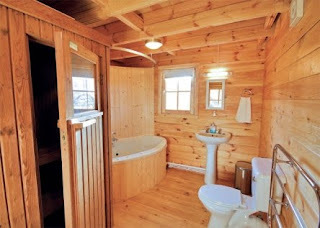 The prices are very affordable so if you have a plan for holiday homes or holiday park facilities why not enquire today? 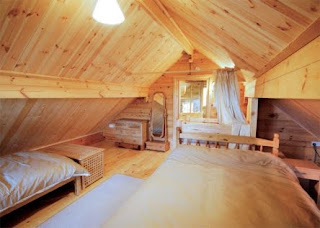 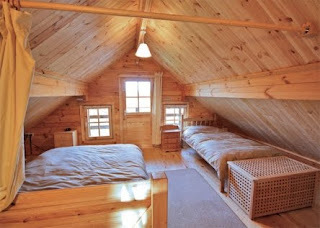 Cosy attic rooms either side of the central stairs. 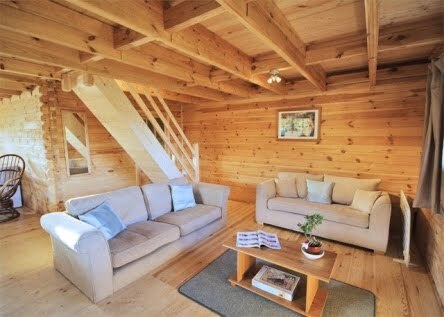 Space to relax and enjoy the setting. 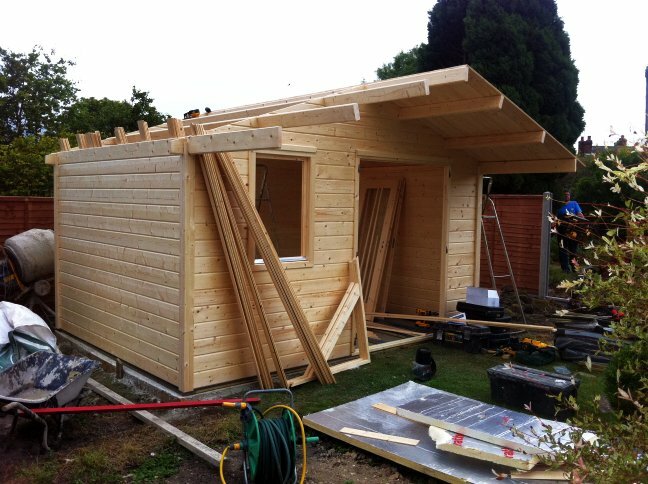 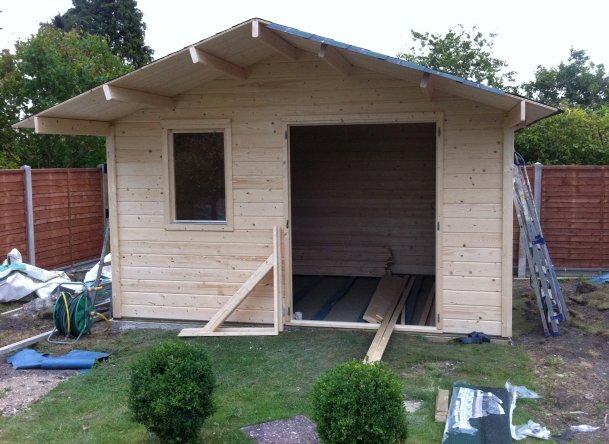 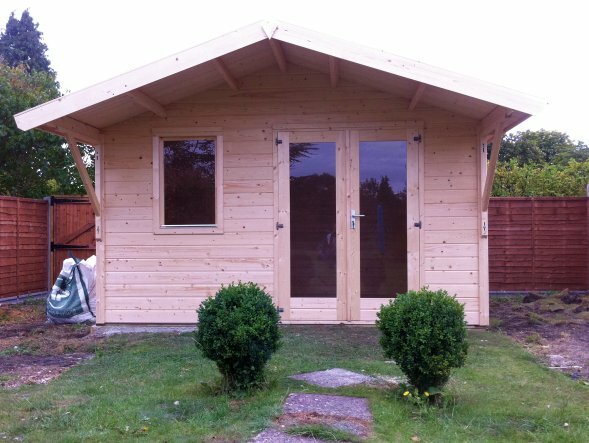 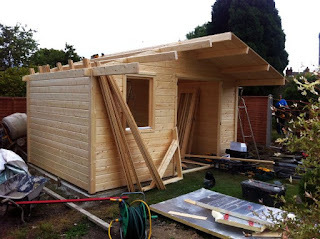 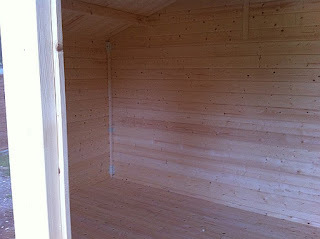 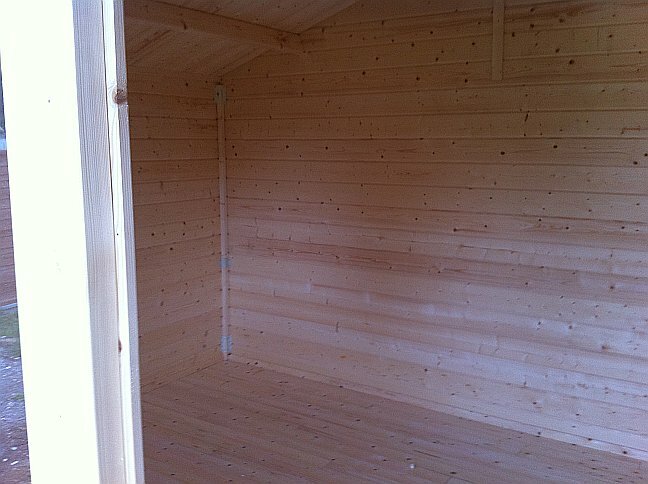 The Cambridge log cabin has 68mm walls which is the standard specification for most of our log houses. Double walls are an option, though with comfort grade insulated floor and ceilings unless you are building to meet building regulations there is no need to insulate the walls. 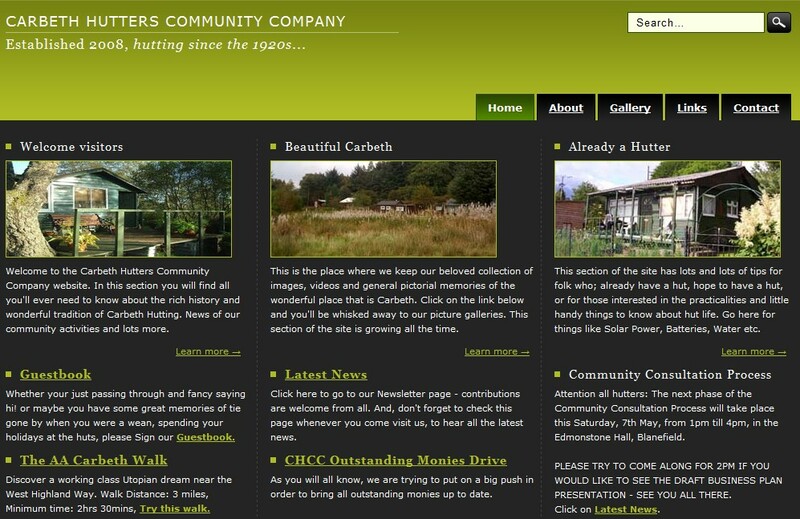 Very interested to see the Carbeth Hutters on BBC news earlier today. 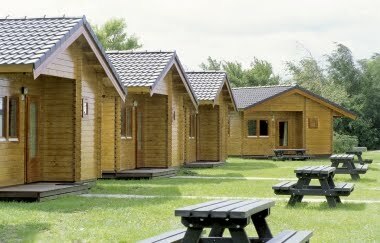 Apparently they have plans (subject to planning) for 1000 new huts ideally with kitchen, living room, bedroom and bathroom. 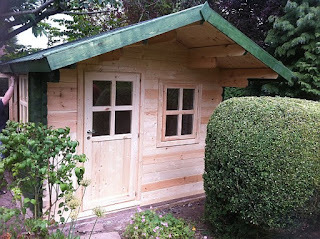 We have the answer with our extensive range of log houses and bespoke hut designs we can produce, supply and install any design you like.